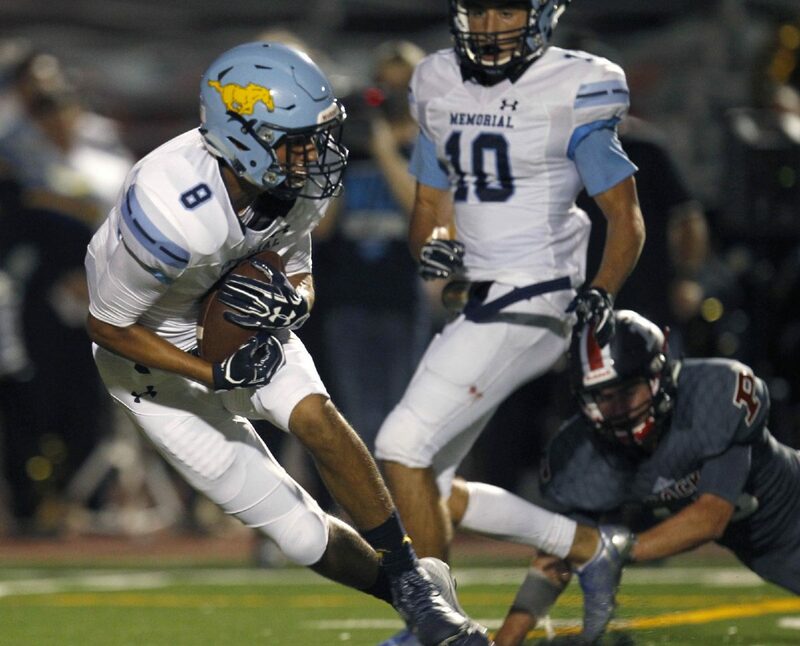 The McAllen Memorial Mustangs are just one week removed from traveling to Weslaco East to knock off the Wildcats 28-14, and that wasn’t even their toughest game of the month. Now, they’ll face an even stronger opponent, with the San Benito Greyhounds visiting McAllen Veterans Memorial Stadium at 7:30 p.m. Friday. The game marks the second time in two weeks the Mustangs will face RGVSports.com’s top-ranked team. Last week in Weslaco, a new facet of the Mustangs’ offense emerged: the home run TD pass. Sean Skaugen completed four passes, all of them going for scoring plays of 40 yards or more. The passing game was a complement to the 127 yards Campbell Speights earned on the ground. What you won’t find from the Mustangs is satisfaction. If Memorial’s coach, Bill Littleton, is an example of his team’s attitude, the group will be laser focused. After his milestone 100th win over then-No. 1 ranked East, the veteran coach was already looking forward at long-term goals. Kelechi Nwachuku was credited with two forced fumbles and will hope his defense can put the brakes on a San Benito team that outgained Memorial 332 to 195 in last season’s tilt. Many skill players from last season’s game return, making for a classic rematch. San Benito’s Erick Retta threw for nearly 200 yards and three TDs against Memorial last year. He also led the Greyhounds rushing attack with 70 of their 108 yards. Memorial’s Nwachuku and seniors like Frank Opazo and Ace Chavez are aiming to be key pieces to knock off the Valley’s No. 1 team. Just like they were against Weslaco East. The Mustangs won the turnover battle by an astonishing 6-0 margin in last week’s win. Six might be a lofty number to repeat, but turnovers in key spots could turn this game on its head. San Benito, however, enters the matchup as the favorite. The Greyhounds have remained perfect through two very different types of wins. In their opener, the Greyhounds needed late-game poise and a masterful drive orchestrated by senior QB Erick Retta to come from behind and beat Laredo United South. In Week 2, against San Antonio East Central, the Greyhounds were back to their usual dominance. Retta threw for 220 yards and three TDs, while running back Tyrone Harper rushed for 176 and two scores. It’ll be interesting to see how the Greyhounds perform in the road rematch of a game they dominated at home in 2016. What does feel like a certainty is that RGV supremacy will be crystal clear after the final whistle Friday night.